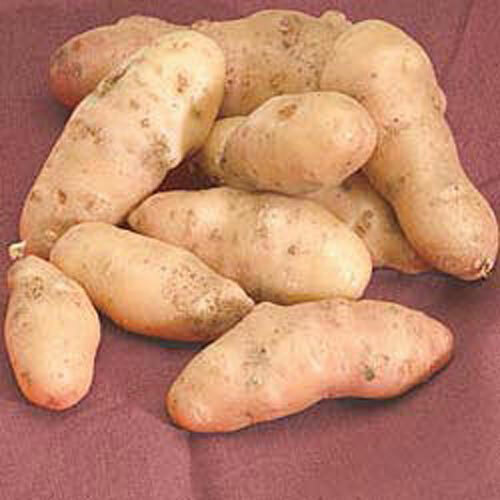 Potato Rose Finn | Gurney's Seed & Nursery Co.
Rose Finn is a fingerling with small cylindrical tubers. Some people say it's the best-tasting potato in the world. These firm potatoes, with their pale yellow flesh, are great roasted. Soil RequirementsWell-drained, fertile loamy soil. Seed Count2 lbs. of seed potatoes. If a seed potato is over 1 inch in diameter, you can cut them into pieces, leaving 1 - 2 eyes per piece. 2 lbs. of seed potatoes will make approximately 10 - 15 potato sets when cut and will plant a 15 foot row. CommentsMaturity is in the medium-late stage. Rose Finn is a fingerling with small slender finger shaped tubers with medium depth eyes and a rose-yellow smooth firm skin and pale yellow flesh. Its use is the specialty market. It will store well. Vigorous vines. Some people think it's the best tasting potato in the world. Depth3 to 5 inches deep, 30 to 36 inches between rows.